Nationwide people are arguing over the color of this dress. While the dress is blue and black, most people see white and gold. In many homes, the men see black and blue and women see gold and white. What do you see and are you a male or female — Republican or Democrat? Seriously Cal Coast News? So much for edgy news and free thinking. What next? Kardashian coverage? You just lowered your standards into the main stream medias mindless abyss of fluffer news. Hey, did you hear that Pretty boy sheriff Parkinson got his $350 k toy boat? Read that on Tribunes site. Common CCN, don’t sell out! I see gold and white. My kids see black and blue. Most people at my work saw gold and white, but there were a few that saw black and blue. We joked about it at work saying it was an IQ thing. and the people who saw gold and white were clearly smarter than those who saw black and blue. Well, I figured this article was a hoax (like the Presidency right now). I looked on multiple monitors which I tested with NTSC color bars for TV production, then I held my 14k gold ring next to the gold (a match) and I held up a white sheet of paper next to the white bands and again, a match. So I musta missed something in the translation, the dress is shades of gold and white, you can keep your plan and doctor, and anybody seeing black in the dress must be participating in the ruse. Is this April 1? Somebody clue me in on what I missed. 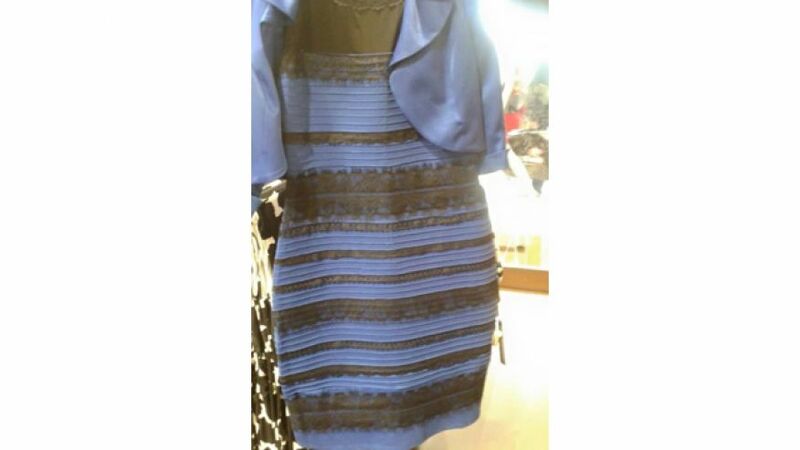 I saw a photo of this dress in the newspaper yesterday and it was clearly black and blue. Holding them next to one another, the colors are nothing alike.